John Kerry Defends Two-State Solution, Rebukes Israeli Settlements : The Two-Way In a more than hourlong address, the outgoing secretary of state sharply criticized Israel's expansion into the West Bank, saying it was making the future prospect of peace ever dimmer. U.S. Secretary of State John Kerry laid out his vision for peace between Israel and the Palestinians Wednesday. 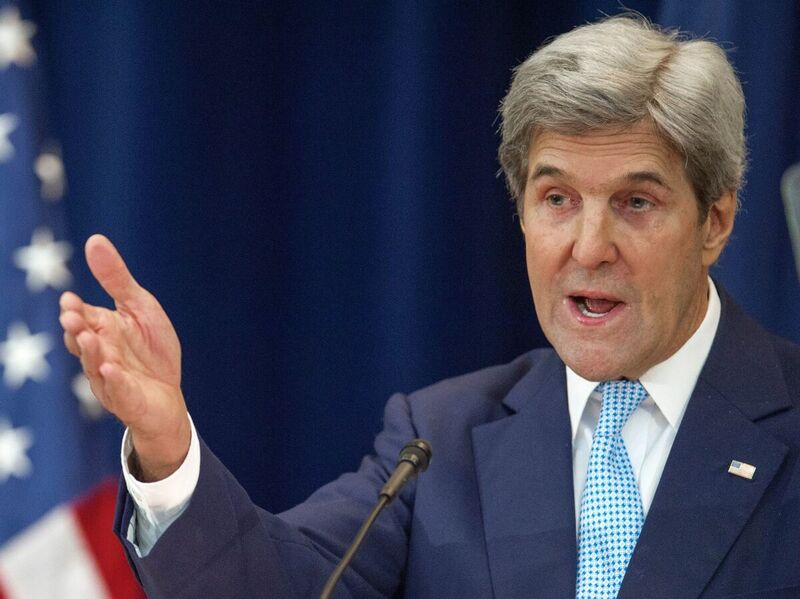 In the more than hourlong address, Kerry criticized Jewish settlements in the West Bank as an impediment to peace. Speaking at the State Department, Kerry sharply criticized the Israeli government's construction of Jewish settlements in the West Bank. He said the policy was dimming the prospect of peace. In the more than hourlong address, Kerry also defended the U.S.'s refusal to block a U.N. Security Council resolution condemning Israeli settlements. The resolution led to fierce accusations that the Obama administration had turned against Israel. "Friends need to tell each other the hard truths, and friendships require mutual respect," Kerry said. Kerry also shut down accusations that the U.S. had engineered the U.N. resolution — a claim by Israel's leader, Benjamin Netanyahu. In a speech shortly thereafter, the prime minister called Kerry's speech "a great disappointment." He warned that Kerry's vision could cause "big, big damage" to his country and said that his speech was "almost as unbalanced" as the United Nations resolution. "With his presidential hopes dashed after his loss to George W. Bush in the 2004 election, Mr. Kerry saw his time as secretary of state as a chance to make a true change in the Middle East. In three weeks, his near-constant travels around the world will end and his energetic diplomacy will suddenly terminate. He has one major accomplishment under his belt — the Iran nuclear deal — but he could not achieve his goals on the Israeli-Palestinian dispute, or in the Syrian civil war." As we've previously reported, peace talks fell apart. Earlier, President-Elect Trump took to Twitter to offer his view. "We cannot continue to let Israel be treated with such total disdain and disrespect. They used to have a great friend in the U.S., but......." he tweeted Wednesday morning. "Not anymore. The beginning of the end was the horrible Iran deal, and now this (U.N.)! Stay strong Israel, January 20th is fast approaching!" His choice for U.S. ambassador to Israel, David M. Friedman, has called the two-state solution an "illusion."